Promotion commences on 12/04/2019 and ends at 11:59pm AEST 05/05/2019 (“Promotional Period”). 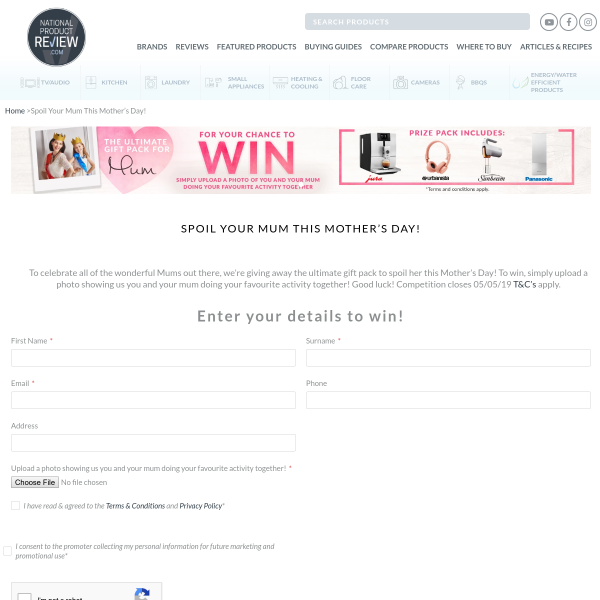 To enter, individuals must complete the following step during the Promotional Period, visit www.nationalproductreview.com, follow the prompts to the promotion entry page, input the requested details (including their full name and email), upload a photo showing of themselves and their mum doing their favourite activity together (“Photograph”) and submit the fully completed entry form. Photographs must be submitted in JPEG format, must be at least 600 pixels (wide) x 500 pixels (high) and must not exceed 35 MB file size.